When your goal is to protect PHI on laptops and mobile devices, keep in mind that information security is only as strong as its weakest link. Lenient information security standards exponentially increases the risk to sensitive healthcare data. It can also place you in non-compliance with the HIPAA Security Rule. On top of that the courts are likely to see it as a security failing in the case of data breaches. Now you’re looking at an expensive law suit! Can you demonstrate device encryption? CEs and BAs, keep in mind, too, that you can’t take advantage of the HIPAA Breach Notification Rule safe harbor if you can’t demonstrate that stolen devices were actually encrypted at the time. If the device isn’t locked down, it’s hard to prove that the device was secure and no PHI or PII accessed when the device is lost or stolen. While Apple tablets and smartphones are natively encrypted, either end users or IT staff need to enable or turn on encryption for Android tablets and smart phones, Windows laptops, tablets and smartphones and Macs. 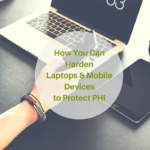 Take the below steps to protect laptops, tablets and smartphones – and to protect PHI. Device hardening is considered a reasonable security safeguard which means it’s a “must do” when it comes to HIPAA compliance and state law compliance in some states. Take the necessary steps to protect PHI and avoid the bad headlines, regulatory penalties, law suits and lost business. If you need to beef up compliance planning, conduct your security risk analysis, or just aren’t sure where to start with any of it, give us a call: 503-384-2538.